These cookies are simple, yet exquisite. 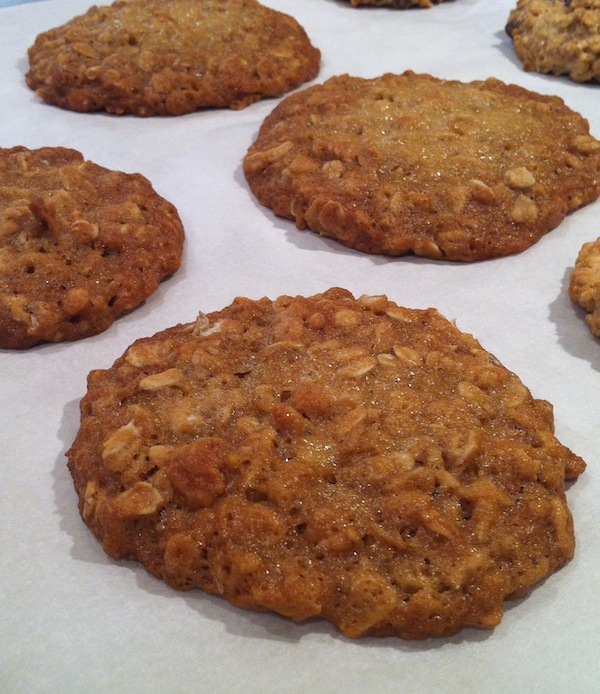 The brown sugar tastes caramelized, giving a rich toffee flavor and nice chewy texture that goes well with the oats. These are definitely going to be one of my go-to cookies. It’s especially good for anyone who isn’t that into chocolate. While obviously cookies are always best when eaten hot from the oven, these maintain their chewiness once cooled too. I doubled the recipe and got nervous that I’d have too many leftovers, but these are definitely a favorite, so I’m glad to have extras in the freezer! In a large bowl, beat together butter and brown sugar until light and fluffy. Beat in the vanilla, then add eggs one at a time, mixing well after each addition. Sift together the flour, salt and baking soda, then add into the creamed butter mixture in 3 batches, mixing until just combined. Fold in the oats. Scoop batter onto lightly greased, or parchment paper covered baking sheet. Bake for 10-12 minutes, until beginning to brown on the edges and center is golden and set. Let cool slightly, then remove to a wire rack to cool completely (I find this is easier to do if the cookies are on parchment paper and then you can just slide the paper onto a wire rack to cool). These cookies are delicious. I suggest these be the first thing baked when my kitchen is done! Wow these look amazing, I love cookies with brown sugar, especially when they are chewy and soft! Thanks! I hope you try them, if you love brown sugar you’re sure to love these!